Other Historical Coins & Misc. Authentic Ancient Roman Bronze Coin in 14kt&n.. 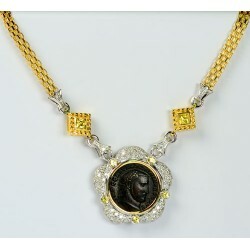 Stunning 14kt yellow and white gold coin necklace with ancient Roman bronze coin of emperor Maximini.. This one of a kind "Cleopatra" style necklace features a Roman bronze coin of emperor Constantius II..